(Phys.org)—A team of researchers with members from institutions in the U.S. and Austria has succeeded in building a device that shows a clear step towards the development of an optical single-phonon detector. In their paper published in the journal Nature, the team describes their device and to what purposes it might be put. Ivan Favero with the University of Paris, offers a News & Views research perspective on the work done by the team and why it represents a big step forward in optomechanics. As the understanding of quantum mechanics has progressed, scientists have found that energy comes in the form of grains called quanta. In the case of electromagnetism, the quanta are in the form of photons, which can now be seen individually using various devices. Quanta that pass though solids (phonons) are more difficult to see individually, which is why a device able to show them has not yet been developed. The reason for the difficulty is of course, in figuring out how to separate the solid material in a way that allows for displaying the phonon. In this new effort, the researchers have built a device that allows for counting individual phonons that passes through a solid, which they hope, is a step towards building a device that can actually see them. The device built by the team is based on a nanostructured semiconductor crystal—it is used to scatter light directed at it by a laser. The laser light is scattered by phonons and is captured by a photon detector. The light that is scattered acquires blue or red spectral bands, depending on whether they are above or below the frequency of the laser beam. If the material in the device absorbs some of the energy from the laser, the scattered photon will have an associated lower energy level—conversely, if the material loses energy during the scattering, than the photon will have a higher energy level. By adding a filter between the device and the detector, the researchers were able to tune the frequency of the laser to allow only those photons through that did not match the frequency of the laser, each adjusted photon that passed though therefore represented one phonon, which the detector counted. The net result was a device able to count phonons passing through a medium, which the researchers hope, is a good first step towards actually seeing them as they pass through. 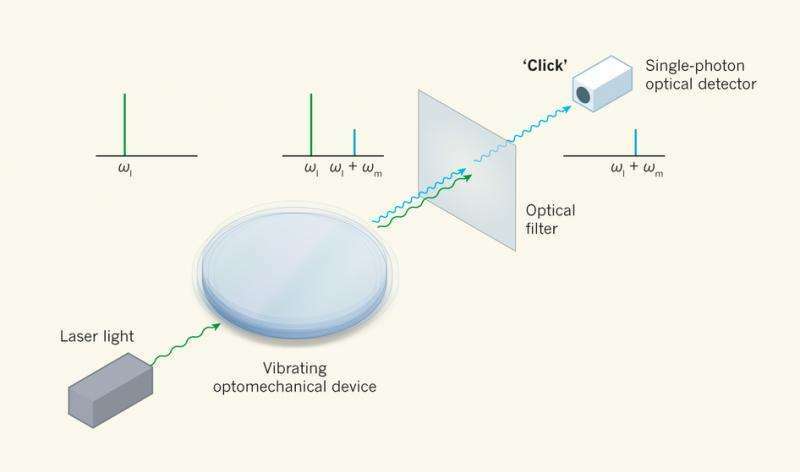 In optics, the ability to measure individual quanta of light (photons) enables a great many applications, ranging from dynamic imaging within living organisms to secure quantum communication. Pioneering photon counting experiments, such as the intensity interferometry performed by Hanbury Brown and Twiss to measure the angular width of visible stars, have played a critical role in our understanding of the full quantum nature of light. As with matter at the atomic scale, the laws of quantum mechanics also govern the properties of macroscopic mechanical objects, providing fundamental quantum limits to the sensitivity of mechanical sensors and transducers. Current research in cavity optomechanics seeks to use light to explore the quantum properties of mechanical systems ranging in size from kilogram-mass mirrors to nanoscale membranes, as well as to develop technologies for precision sensing6 and quantum information processing. Here we use an optical probe and single-photon detection to study the acoustic emission and absorption processes in a silicon nanomechanical resonator, and perform a measurement similar to that used by Hanbury Brown and Twiss to measure correlations in the emitted phonons as the resonator undergoes a parametric instability formally equivalent to that of a laser. Owing to the cavity-enhanced coupling of light with mechanical motion, this effective phonon counting technique has a noise equivalent phonon sensitivity of 0.89 ± 0.05. With straightforward improvements to this method, a variety of quantum state engineering tasks using mesoscopic mechanical resonators would be enabled, including the generation and heralding of single-phonon Fock states and the quantum entanglement of remote mechanical elements.